Two years in, it’s exciting times for the IPA and for its data. As the IPA has established itself across Whitehall, its teams have been expanding their goals, including the rebranded Analysis and Insight Unit - AIU (previously the Portfolio Insight Team) which is part of IPA’s Strategy and Policy department. 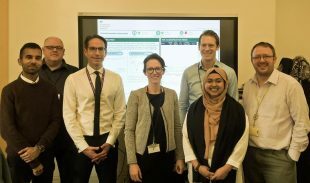 The team has grown in terms of size and focus since the summer - now with specialist capability across the analytical professions of economics, research and data, and a package of work that seeks to drive clear insights from the information we collate across the government’s major projects. Interactive dashboards and data visualisation - using Tableau and other high quality data visualisation for rapid, insightful interpretation of complex data. Prioritisation toolkit - building a multi-criteria toolkit, combining quantitative and subjective data, to prioritise projects and resources. Regular insight reports and project updates - distilling large datasets, tracking change over time and understanding project performance within the GMPP - most of which features in the IPA’s Annual Report on Major Projects. Our largest and most important data source is the Government Major Projects Portfolio (GMPP), housed by AIU. It collates a range of information to track and aid project delivery across Whitehall. Data has been collected on GMPP for a number of years and it’s a significant cross-government source of information on major projects. We publish annual updates on this data in our annual reports. Data analytics is the team’s foundation, but AIU is also outward looking, and rapidly building links with other analysts and teams who use its data, helping to bring the data to life and surface the most valuable insights. We also work closely and collaborate with a number of leading academics through our involvement with Project X. So do get in touch with a member of the team if you’re interested in finding out more about the AIU, the GMPP database or any of our work ipa@ipa.gov.uk.